Fairfax County is a large and growing urban county and a major part of the Washington-Arlington-Alexandria, DC-VA-MD-WV Metropolitan Statistical Division. To assess its effectiveness, three criteria are utilized; reliability, function and cost. The evaluation is based on the belief that government is the solution and not the problem to the public it serves. According to the U.S. Census, Fairfax County’s 2017 population is estimated to be 1,148,433, an increase of 66,707 since the decennial census of 2010. It is also the most populous county within the sprawling region that includes 15 counties, six independent cities and the District of Columbia as configured by the Office of Management and Budget memo of August 2017. Fairfax County contains three incorporated towns and two independent cities. Most of its population resides within a mixture of over 400 unincorporated places that rely on the county for their municipal services. A detailed listing can be found on virginia.hometownlocater.com. In addition to a full mixture of urban county services, it collects taxes, funds and operates a large public school system. So how has the county managed through its growth and prosperity? Like many counties with major development occurring in its unincorporated areas, Fairfax County has assumed authority over most of its land use decisions. As they expanded, this function along with others had became increasingly important so in 1999, they developed a comprehensive performance measurement process to monitor, report and improve their reliability. According to their web site “the county is among 29 jurisdictions nationally to receive ICMAs Certificate of Excellence in 2018, for its commitment to collect and analyze data, report it transparently, and use it continuously to engage our communities, and improve our performance.” Their latest reports, dated 2017, present an exemplary array of performance statistics for their Department of Planning and Zoning that manages growth. Clearly, they have come a long way to advance their professionalism since 1966, when “a federal grand jury gained national attention when it indicted fifteen people under the Federal Racketeering Act on charges of conspiracy to exchange bribes for zoning in Fairfax County” as Garreau revealed in his book. This area of analysis is viewed from two perspectives: the internal organization’s operation and the external functionality of the county. Internally, the information from their performance measurement process affirms Fairfax County as a well-run organization. But externally, one major issue dominates the public agenda resulting from their compounded land use decisions – traffic congestion. 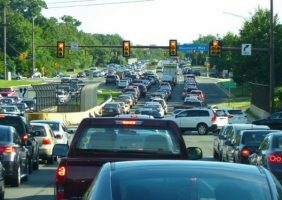 In 2017, businessinsider.com rated the Washington DC area the third worst congested metropolitan area in the country with the worst “hot-spot” located at I-95 S at Exit 133A to Fairfax County Parkway. The traffic data firm INRIX estimated the cost to be $29.2 billion if nothing was done by 2026 based on wasted time, fuel and emissions. This is a significant burden to its residents. Although projects are ongoing to alleviate the congestion, they are expensive and intrusive because they have been undertaken reactively. Fairfax County’s property taxes are above the Virginia average but lower than the national average. Smartasset.com estimates a property tax on a home in Fairfax County with a value of $250,000 at $2,453 compared to a national average of $3,028 and a Virginia average of $1,993. But with an average 2018 assessment of $547,219, as reported on the county web site, actual property taxation is actually much higher. Still, considering the size of the county and the services that it delivers, the impact of property taxes from the perspective of a large, urban county are acceptable. In addition, their combined sales tax of 6 percent is in keeping with Virginia’s fiscally conservative approach that claims to have the tenth lowest sales tax in the nation, according to salestaxstates.com. In summary, Fairfax County is a reliable organization with good internal functionality delivered at a reasonable cost. However, their growth has created one major problem. To become a solution, they must accelerate their efforts to relieve congestion by placing traffic issues at the forefront of future planning and capital funding decisions.